Vientiane Capital, the capital city of Lao PDR, is a small, relaxed city, located in the central of Laos. The capital city has more of a small town feel than that of a capital. 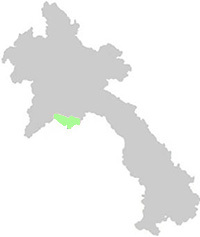 It is stretched out on the north-eastern bank of a bend in the Mekong River. From the river bank inland, the three main roads run parallel to the river, while the largest and widest boulevard, Lane Xang Ave, runs from the Presidential Palace to the northeast around Patuxai, the Victory Gate, towards the That Luang Stupa, the most important religious monument in Laos. One of the best ways to travel is by bike and they can be hired from many places around town from between 10,000 and 20,000 kip per day. All the roads in Vientiane capital are paved and there is good street lighting. Although Vientiane city bus system doesn't cover as widely, there are buses to many tourist sites outskirt of the capital city such as Buddha Park. Taxis are not widely available in Laos, however, you can book one through your hotel or online. If you plan to get out and flag one down as you would in other big cities like Bangkok, you will have to wait for a long long time before you see one (if at all). Most of the restaurants, cafes are in the main “downtown” area and getting around is easy on foot, by bicycle or by tuk tuk. There are several mini markets selling western food and other necessities. There is a big variety of cuisine, from the local street food to good quality Lao and international restaurants including European, Indian, Japanese and vegetarian eating places. There are many temples in the town itself, so it is easy to stroll around and visit most of them, but remember the dress rules – women should wear modest clothes (covered arms and at least knee-length shorts and skirt, and men in T-shirts and shorts at a minimum) and shoes should be removed before entering a temple. Once a month, local monks gather at the Sangha College (Wat Ongteu) for Monk Chat with tourists. Monk Chat can also be found on Facebook. Some temples (Wat Si Saket, That Luang and Haw Pha Kaew) charge a small entry fee for Lao nationals and foreigners. Vientiane has several markets, both for day to day needs and for souvenirs; the biggest of these is the Morning Market, about 10-15 minutes walk from the centre of town. There is also a vast range of shops selling traditional silk weaving and other handicrafts. There are three night markets along the riverfront selling ethnic goods as well as other stuff. The biggest one is at King Anouvong Park (upper part), another one is at the lower part of the park (closer to the Mekong River) and the last one is to the south of King Anouvong stupa, behind the buildings of many restaurants (close to Done Chanh Hotel). These are great places for your last minute shopping for souvenirs. There are also open-air bars, that offer all kind of drinks, BBQ, and more. In Vientiane Capital, it is possible to enjoy bars and music venues of many types. Some of the most popular venues for a sunset beer are the small outside local “cafes” which spring up along the river front every night. The recent riverfront redevelopment added more public space and green areas to the city. King Anouvong Park locating on the river bank behind the Presidential Palace is a part of the project. This is the best place to watch sunset in Vientiane. In the park there are gym equipment for the public to use for free. There is also children play ground a bit further up, thanks to the Korean government for installation of these. Apart from exploring the city itself there are several nice places to see around the capital city, where you can go kayaking, wild-water rafting, trekking through nature parks, such as Nam Ngum Lake, the Nam Lik eco-adventure area, Tha Ngon floating fish restaurant, Buddha Park and the Phou Khao Khouay national park.